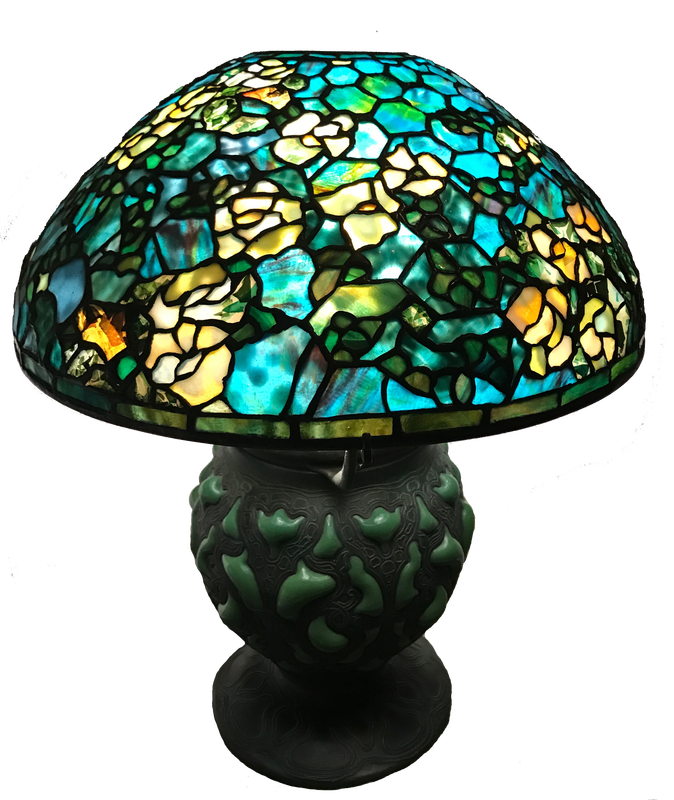 Sell Your Tiffany Studios Authentic Lamps - Tiffany Studios Genuine Antique to Sell Your Tiffany Studio Art. Antiques or who has been collecting antiques including Tiffany Studios Lamps. 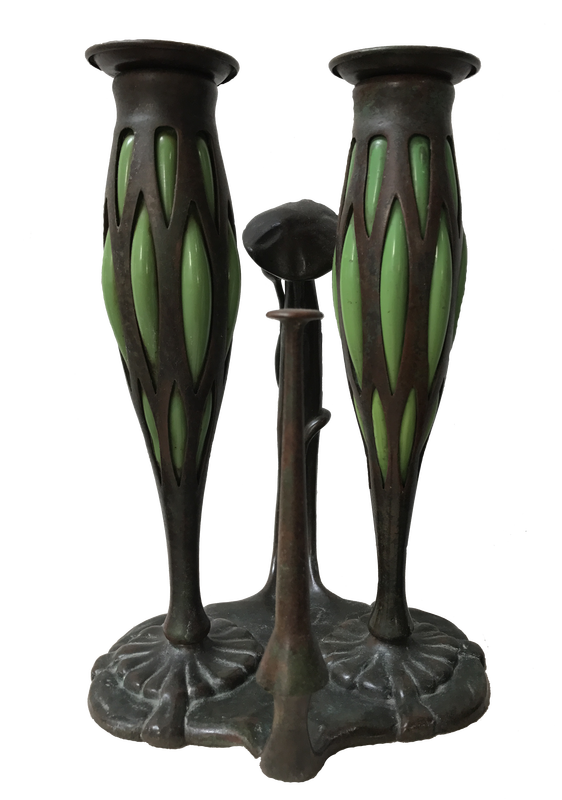 - Sell Your Antiques Including Tiffany Studios, Coin-Operated Machines, Stained Glass, and American Folk Art for over a Dr. Robert Lerch - Fine Art Collector - Tiffany Studios, Sell Your Antiques Here. The Doc has been collecting for over 40 years in New York! 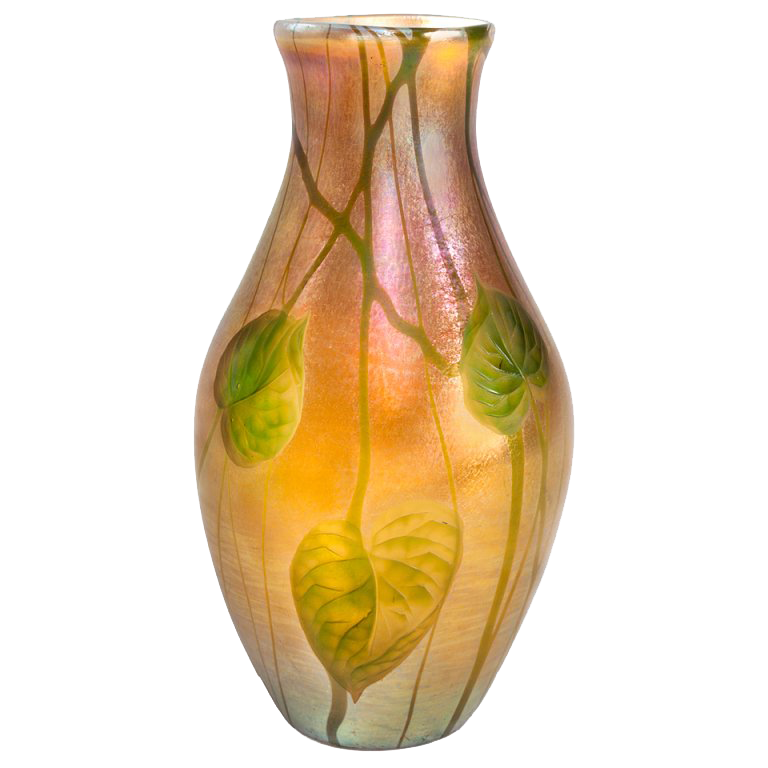 Get The Best Price For Your Tiffany Studios Art Pieces. 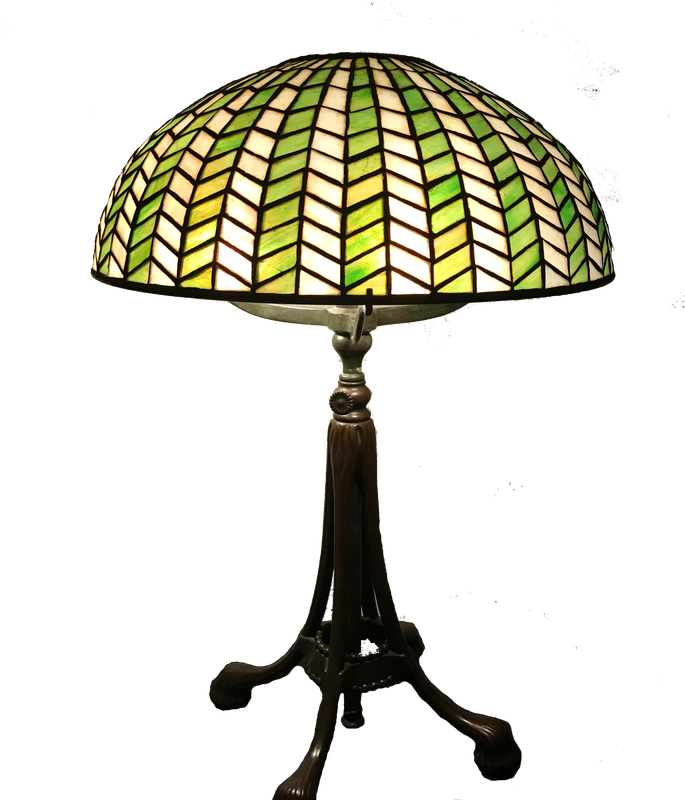 Selling Your Original Tiffany Studios Lamps? Genuine Very rare Rambling Rose Tiffany Studios lamp of bronze and blown-out glass base. The use of very unusual coloring and tonalities with dichroic, confetti and mottled glass make this shade extremely desirable. 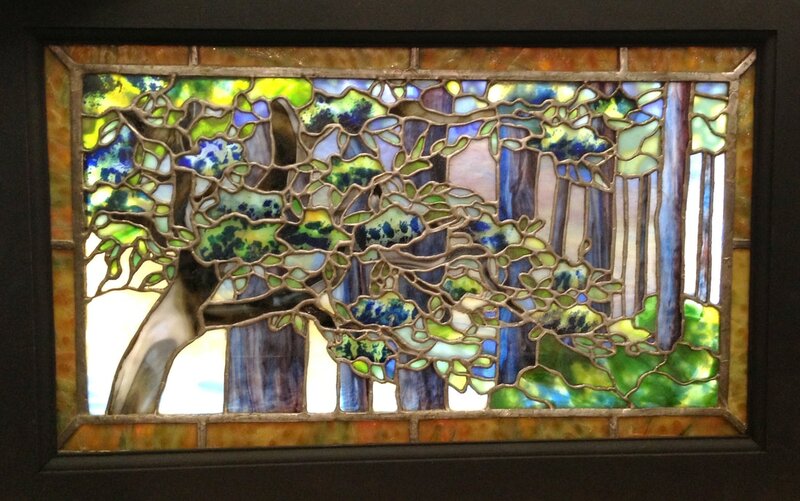 Unusual Diminutive Tiffany Studios landscape window with exceptional studio glass including confetti glass. While he continued to paint throughout his life, he was dissatisfied with his development and focused on the burgeoning arts and crafts movement. Tiffany with Lockwood de Forest, Samuel Coleman, and Candace Wheeler (the founder of the New York Society for The Decorative Arts) established the company of Louis C. Tiffany and Associated Artists. The firm would specialize in interior decorating and became immediately successful. The firm's commissions include the Seventh Regiment Armory, the Union League Club, the White House, and the homes of Mark Twain, H.O. Havemeyer, Cornelius Vanderbilt. One of the major features of the Associated Artists was Tiffanys use of glass tiles and windows. He had been experimenting with glass as early as 1875 and in 1878 established his own glasshouse with a Venetian expert as its supervisor. At this point Tiffany decided to devide his interior decorating firm into two independent branches: Associated Artists would produce all of the textiles and the Louis C. Tiffany and company would produce all of the stained glass windows. Inspired by ancient glass which acquired a very attractive iridescence on it surface after being buried for many centuries he developed a method of artificially iridizing glass with the used of various acid fumes and heavy metals, which led to the creation of Favrile glass. His Favrile glass was able to be produce in any color and any luster that might be required. This new glass enable Tiffany to avoid the application of paint , stains or enamels which had traditionally been used with stained glass. An additional innovation was the manner in which the windows were leaded to outline the components of the subject at hand. Additionally the use of multiple layers of glass that were "plated" together was introduced which allowed further artistic variations in colors, textures, and densities. One of the most important stained glass commissions was in 1885 for Sameuel Bing's Salon de l'Art Nouveau in Paris. In addition to producing stained glass windows, Tiffany began producing glass mosaics inspired by the use of glass in Byzantine mosaics. The first mosaic was procured in 1879. 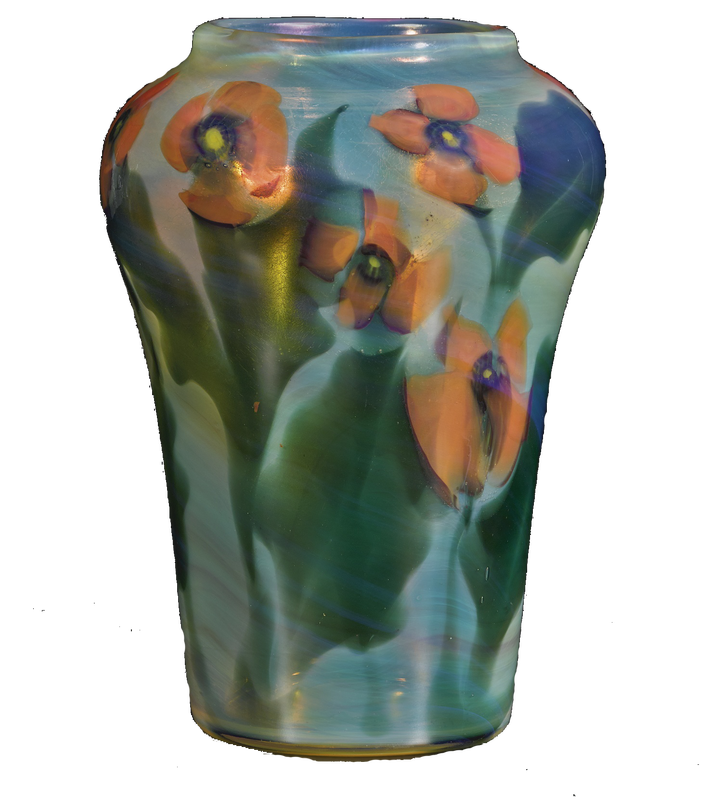 The Tiffany Glass Company was established in Corona, Queens to produce glass items in 1885. In 1892 the name was changed to the Tiffany Glass and Decorating Company and in 1902 the company was divided into Tiffany Studios, which would procured furniture, draperied, rugs, lighting fixtures, stained glass windows, mosaics, bronze desk sets, sculpture, jewelry, pottery, wrought ironwork, enamel pieces, and garden marble, and Tiffany Furnaces, which made the Favrile glass and glassware. 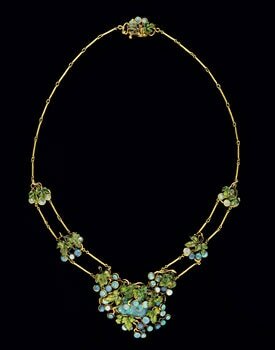 Tiffany's involvement in the glass production was primarily the design of the pieces and approval of all of the designs created by his employees. He encouraged experimentation and wanted each piece of glass to be a one of a kind piece. Museums throughout the world obtained examples of the glass and it received many awards from the Chicago's Columbian Exposition, the St. Louis Exposition, and the Panama-Pacific Exposition.